A port city in the easternmost corner of northern Italy, right on the border with Slovenia, at the northern end of the Istrian peninsula (Croatia), and once an important Mediterranean naval base of the Habsburg Empire (Austria-Hungary). The dark sites to be seen here primarily pertain to the short but grim phase of Nazi German occupation (when a concentration camp was set up here) and the period at the end of WWII and immediately afterwards, when Yugoslav partisans briefly took over the city. More background info: Trieste is an ancient city tracing its roots back some four millennia. In Ancient Roman times it became an important port city, and over the following millennium or two repeatedly changed hands between the Byzentines, Franks, Venetians, Germans, French and Austrians. Eventually it firmly became part of the Habsburg Empire in the 19th century. Trieste (like Pula and other Adriatic ports further south) provided vital access to the Mediterranean Sea for the otherwise landlocked empire and as such became an important naval base. In addition to its military importance, Trieste also remained a significant merchant city and at the turn of the 20th century had become a cultural hotbed as well. It developed a decidedly Central European air, also reflected in its architecture, which is often more akin to Vienna or Budapest than any Italian cities. This unique character partly remains to this day (see below). Almost a cultural enclave on the “Austrian Riviera” the city attracted many artists, philosophers and intellectuals – amongst them James Joyce and Sigmund Freud. It also had a large Jewish community. But with WW1 the city's fate would begin to change dramatically. Owing to Italy's involvement in the war, especially on the Isonzo front just north of Trieste (see Kobarid and Kolovrat) Italy was granted territorial gains at the end of the war. And this included Trieste as well as parts of what today is Slovenia. With the Italian takeover came a phase of enforced Italianization and repression against mainly Slovenes. Many of the latter emigrated to evade the repression, while many Italians moved in. But there was also resistance, especially from anti-fascist Slovene organizations. However, Italian fascism was on the rise and when Italy annexed more parts of Slovenia (including Ljubljana), ethnic Slovenes became victims of brutal persecution and incarceration in Italian concentration camps (see especially Rab!). Italian fascism also left its mark on Trieste in terms of architecture – in particular the new main building of the university bears the hallmarks of Italian fascist intimidation architecture (cf. also Rome). The rise of fascism was bad news for Trieste's large Jewish community who also faced new repression through “race laws”. But the real horror only unfolded when the Germans moved in. After Italy ousted Mussolini and surrendered to the Allies in September 1943, Hitler had the Duce nominally reinstated and Nazi Germany's troops de facto occupied the northern half of Italy, as well as its annexed territories in the Balkans. And with that the Holocaust also arrived in Trieste. The Germans established a concentration camp at the Risiera di San Sabba, where thousands of Jews, Slavs and anti-fascists died. Even more Jews were deported to the camps back in the Reich or in occupied Poland. At the end of WWII, Yugoslav partisans took over Trieste for a while before the city fell under Allied administration. During the 40 days of Yugoslav occupation, the partisans launched a campaign of retaliation against Italians presumed to be fascists as well as against anti-communist Slovenes. Many were deported and quite a few murdered. This was the time of the infamous “foibe” (see Foiba di Basovizza), karst sinkholes in the hinterland of Trieste into which bodies of the victims were simply dumped by the partisans (although before them the Italians and Germans had used these foibe for the same purpose as well). From 1947 to 1954 the region was declared a “Free Territory” by the UN, with the western half, including the city of Trieste, under Allied administration (Britain and the USA), and the eastern half administered by Yugoslavia. In 1954, most of the western half returned to Italy, while the eastern half remained with Yugoslavia. Some border issues were not resolved until 1975, though. But Trieste has since become a firmly Italian city and an important harbour and industrial centre. The city has only about a quarter of a million inhabitants, but it feels much bigger and more metropolitan than this population size would suggest. That's partly due to all the busy industry and the port, and also due to the grandness of the architecture and the wide boulevards. Quite a unique place! My visit to Trieste was only very short, just one overnight stay. I arrived from Pula in Croatia and visited the two sites listed above on my way into the city, and then went for a walk for a few hours. That was it. The next morning I drove off back to Zagreb. Given this time restriction I missed out on a couple of things that could also have been of dark-tourism interest. The first is the so-called “Kleine Berlin” (never mind it's ungrammatical in German): a set of underground air-raid shelters dug into the side of one of Trieste's many hills during the German occupation of the city in WWII. These bunkers are only open to the public on specific days, namely every last Friday of the month, at 8 p.m., when a guided tour takes visitors around (run by the Trieste Alpine Club). The entrance is opposite 11 Fabio Severo Street. I could not find out anything about prices … maybe it's free? I also did not find the time to make my way out to the main University building, which is Trieste's prime example of Italian fascist architecture. And I deliberately decided to give a miss to the “Diego de Henriquez War Museum for Peace” (22 Via Costantino Cumano; Wed-Mon 10 a.m. to 5 p.m., Sat/Sun to 7 p.m., 6€), as it's mostly just a collection of weapons, vehicles and artillery, which I didn't find so exciting. One exhibit, though, could have been worth it: a horse-drawn hearse of the same type as was used to transport the dead body of Crown Prince Franz Ferdinand, who had been assassinated in Sarajevo in 1914, leading to the outbreak of WW1. I did, however, walk up Via del Monte, past the Jewish Museum (closed at the time I was there) to the Parco della Rimembranza. In this remembrance park several stones are dotted around that bear inscriptions linking them to various episodes of WWII and the resistance against the Nazis. There is also a dedicated memorial to the “martyrs” of the Foibe (see above). 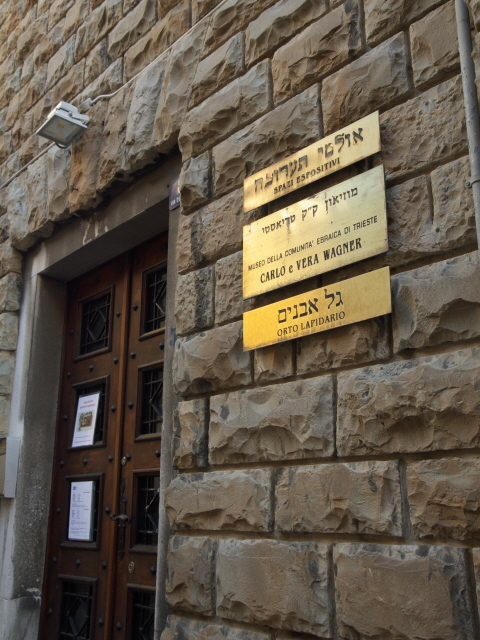 The largest piece of evidence of Trieste's Jewish heritage is the great synagogue on the corner of Via S. Francesco D'Assisi and Via Guido Zanetti, just behind the Caffé San Marco (see below). It is an impressive building, one of the largest synagogues in Europe. Other places of worship include not only the expected Catholic churches but, to my surprise, also a sizeable Serbian Orthodox church right in the heart of the city by the eastern end of the canal. Those into industrial heritage may want to head to the restored historic electric converter substation at the northern end of the port of Trieste. And just driving past the enormous steelworks in the southern part of the harbour (near the Risiera) is also something for those (like me) with a penchant for dirty old heavy industry. Location: in the easternmost corner of northern Italy, right on the border with Slovenia, ca. 50 miles (80 km) south-west of Ljubljana, a similar distance north of Pula, Croatia, but more than 220 miles (360 km) east of Milan. Access and costs: Trieste may be in an extreme location with regard to the rest of Italy, but it is fairly easy to get there by road, rail, plane and even boat. The price levels are a bit higher than in the surrounding area. Details: Trieste is connected to the rest of Italy by a thin strip of land to the north-west of the city while being surrounded on three sides by Slovenian territory. The Istrian peninsula of Croatia is also just a short distance away. And so it came that I visited Trieste as an add-on to my Croatia road trip in April 2018, as it was cheaper to pay the extra to the hire car company for taking the vehicle abroad than what it would have cost me to go to Trieste from Vienna, where I am based. And when I last toured Italy, visiting Bologna and Milan, the drive to Trieste seemed too long (3 to 4 hours one way!). By train, the most convenient route is from/via Venice, from where there are frequent and relatively fast connections. The airport serving Trieste is not actually in or even especially near the city (not surprisingly if you consider the terrain and proximity of international borders), but is north-west of Monfalcone. The airport is shared between Trieste, Udine and the whole Friuli Venezia region. Transfers by train from the airport to Trieste take almost an hour. 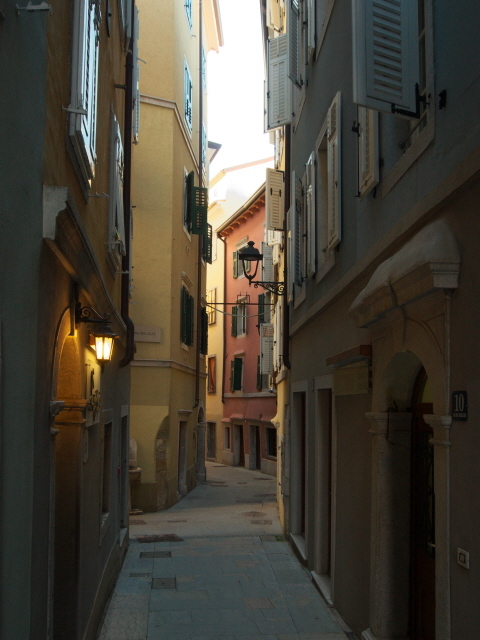 For getting around within the centre of Trieste you can mostly walk. Public transport is provided by buses, but you'd rarely need these. However, to get to the prime dark sites covered here, it's easier if have your own means of transport, especially for the Foiba di Basovizza out in the mountains above Trieste (or else you have to go on a long bus ride and then hike). Accommodation options in Trieste are plentiful, but prices are a bit higher than in neighbouring Slovenia or Croatia. But for a rate of around 100 EUR per night in a double room, you can find several very decent hotels right in the centre. As for food & drink – this is a major joy in Trieste, where Italian culinary gusto and hospitality meet some elements of the Slovenian/Croatian culinary traditions from the region south of Trieste. Given the location on the Adriatic coast, fish and seafood unsurprisingly play a prominent role. 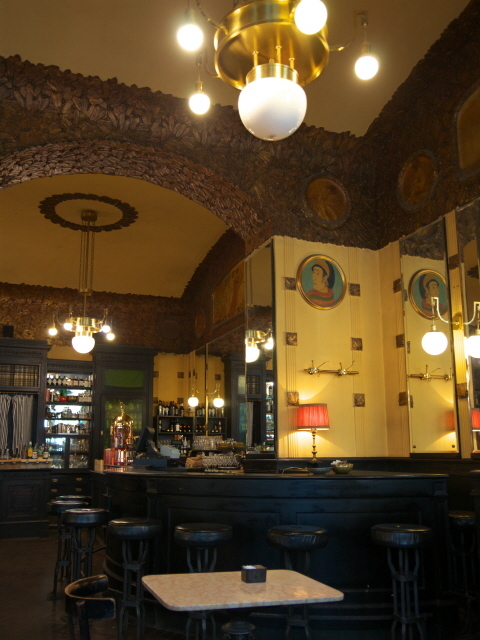 A leftover from the Habsburg era is Trieste's pronounced coffee & café culture (see below). Time required: When I visited Trieste (as an add-on to my Croatia trip in April 2018) I only had one day, and I felt that was definitely not enough. At least two or three days would do the place much more justice. Combinations with other dark destinations: due to its extreme location, Trieste actually combines better with destinations within neighbouring Slovenia and Croatia than with the rest of Italy. Ljubljana and Pula / Brioni are actually closer to Trieste than Venice, and Zagreb is also only a few hours drive away. A special dark destination just across the Slovenian border to the north of Trieste is Kobarid, a place that played an important role in the WW1 battles of Isonzo, which had such significance for Trieste's subsequent history and as such makes for a very meaningful combination. On the Italian side of the border, the open-air Theme Park of the Great War just outside the city of Monfalcone (15 miles / 25 km north-west of Trieste) would also make a fitting combination. The closest other dark destination featured on this website that's located within Italy would be the (thematically totally unrelated) Vajont Dam near Longarone, some 130 miles (200 km) by road from Trieste. Combinations with non-dark destinations: Trieste has plenty to offer for the non-dark tourist, in terms of architecture, culture and not least in culinary terms. Of course, just like every self-respecting Italian city, Trieste boasts some Ancient Roman remains, such as an old Roman theatre and the Arco di Riccardo, both in the heart of the Old Town. But in general, due to its cultural heritage from the long period of being part of the Habsburg Empire, much of the architecture feels more Central European than Italian. In other respects, street life, fashion, and especially in culinary terms, though, Trieste is very, very Italian at the same time. Nor did I have the time for much other cultural tourist activities – since I only had one night in Trieste, tagged on to my March/April 2018 Croatia trip, and had to concentrate on the dark-tourism-relevant places here.